Tom Greene Ecological was founded in 1999. We focus on ecological site assessment – including wetland delineation and mitigation, endangered species surveys and management, environmental impact assessment, natural community mapping, natural features inventory, conservation easement documentation reports, vegetation surveys and monitoring, and related tasks. Geographic Information System and G.P.S. are integral to our work. We have experience with governmental, industrial, commercial and residential projects. Our approach includes sensitivity to the needs of the client and a resource focus. Lowell Correctional Institution – Identified wetland mitigation options within a three county area and on-site, scored proposed mitigation areas with UMAM, and produced a wetland mitigation plan approved by St. Johns Water Management District on a 1400 acre site in Marion County. Subsequently produced annual wetland mitigation monitoring reports, conducted mitigation site inspections, and performed tree planting and invasive species removal for a created wetland on this site. Client: Florida Department of Corrections. Point Washington State Forest -- Mapped wet prairies, censused state-listed plant species and mapped new listed plant locations on a 15,000 acre state forest in Walton County. Performed for the Florida Forest Service, Florida Native Plant Society and The Longleaf Alliance. 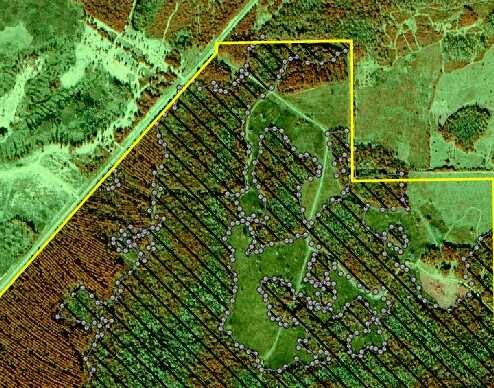 Celestial Gardens Subdivision – Delineated 900’ of wetland boundary; surveyed for presence and location of gopher tortoise, bent golden aster and Sherman’s fox squirrel; wrote habitat management plans for these species; and described vegetation on a 28 acre site in Leon County. Client: Spectra Engineering. Usher Family Trust – Delineated 28.5 miles of wetland boundary in hydric hammock, cypress-hardwood and cypress dome ecosystems; and produced G.I.S maps and shapefiles of all wetlands from GPS data; on a 2000 acre site in Levy County. Client: Suwannee River Water Management District/Spectra Engineering. Endangered Plant Conservation Strategies – Developed guidelines on the effects and use of thirty forest management practices in the habitat of three federally listed plant species, Macbridea alba, Euphorbia telephioides and Schwalbea americana, for review by the U.S. Fish and Wildlife Service. Client: U.S. Forest Service, Southern Region. Meridian Greenway – Surveyed for presence of listed species, wetlands, native forests and other environmental constraints; provided an impact and mitigation analysis; and created G.I.S. shapefiles for location of the environmental features; for a 3 mile-long corridor for a proposed recreation trail in Tallahassee, Florida. Client: City of Tallahassee. 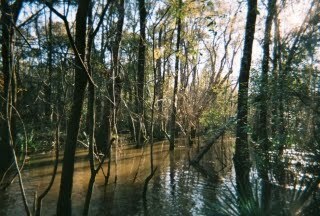 Environmentally Sensitive Areas of Leon County – Produced maps of wetlands, listed species, upland forests, high-quality natural communities, waterbodies, watercourses, watersheds, flood-prone areas, steep grades, karst features and physiography, based on source maps and field verification, in conjunction with a project team. Performed for Leon County Department of Growth and Environmental Management. Hopkins Crossing – Developed survey protocol and surveyed for the presence of gopher frogs in gopher tortoise burrows using live traps, on a commercial site in Leon County. Client: Helge Swanson and Associates. Florida Pest Control – Delineated wetlands and surveyed for presence of listed species, native forests and karst features on a commercial site in Leon County. Client: Jaks Engineering. California Swamp Conservation Easement – Described vegetation communities, listed species and wildlife; and documented with photographs; on a 30,000 acre site in Dixie County. Client: Suwannee River Water Management District/Spectra Engineering. Clayton Landfill – Surveyed for presence of listed species and wetlands, and described vegetation on a 53 acre site in Gadsden County. Client: Big Bend Technologies. Collins Landing Road Parcel – Conducted pre-development site assessment for presence of environmental features and regulatory restrictions on development of a single family residential site in Leon County. Client: Dr. John Backe. Gum Swamp Restoration – Assessed existing and original vegetation and ecosystem type, history of disturbance over a 50 year period, and current condition and health of Gum Swamp, a 200 acre artificially drained swamp in Leon County. Conducted baseline vegetation monitoring prior to construction of a restoration weir. Performed for Leon County Department of Growth and Environmental Management and Leon County Department of Public Works. Buccaneer Gas Pipeline – Conducted threatened and endangered species surveys and wetland delineation for a proposed pipeline corridor in Polk, Pasco and Lake Counties, Florida. Performed for Ecology and Environment, Inc.
Blairstone Road Extension – Provided technical comments in support of a challenge to a FDEP Wetland Resource Permit and Stormwater General Permit for a 1.4 mile portion of the Blairstone Road corridor in Tallahassee, Florida. Client: Neighborhood Environmental Preservation Coalition. Watson Exchange Conservation Easement – Described vegetation types and listed species, documented with photographs, and created a vegetation map and photo point locations as G.I.S. shapefiles; on an 18 acre site in Escambia County. Client: Northwest Florida Water Management District/Spectra Engineering. Qualifications of the Principal, Tom Greene, include a Bachelor of Science degree in Biological Science and Biochemistry with a Minor in Urban Planning from Florida State University, and graduate work in Ecology at Florida State. Experience includes 10 years as an environmental professional for the Leon County Department of Growth and Environmental Management. Areas of expertise include ecology, botany and environmental management. We are familiar with wetland and terrestrial ecosystems in Florida and the Southeast.